King tide at Bucklands Beach, Auckland. Image courtesy of Ben Sheeran. Diversity, inundation maps, sea walls, leadership and liabilities. When it comes to protecting our foreshores, council parks teams have their hands full. Ruth Le Pla reports on their complex work in an age of climate change. Auckland Council’s Ian Maxwell has appealed to councils to look for new ways to engage a wider variety of community members in climate change and environmental protection initiatives. Ian is Auckland Council’s director of community services – a unit which brings together council’s parks, libraries and community development activities. Speaking at the New Zealand Recreation Association Coastal Parks and Climate Change seminar earlier this year, he praised the King Tides Auckland movement as a “great” community initiative. 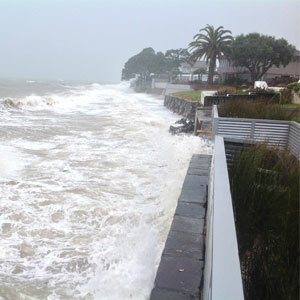 King tide, Milford Beach, Auckland. Part of the global King Tides movement, King Tides Auckland identifies when unusually high (king) tides will occur and encourages people to take and share photos of the events. The snag is, like many of council’s own climate change and environmental protection initiatives, the movement “almost always” attracts disproportionate numbers of European people. Very few young Polynesians are involved, for example, he says. This is what Ian Maxwell, Auckland Council’s director of community services, encourages people in other councils to do. • Accept climate change science. If other people in your council don’t believe in the science, get them to go out and look at king tides. People know the seasons are changing and that plants are behaving differently to how they used to. Use that kind of information to get people over the line. • You, and the organisations you work for, can make a difference. So don’t wait for a great integrated programme or an absolutely nailed-down policy. You may not be able to control the intensity of your urban area or utilisation of public transport but you can control things in your area. So start there. • Keep pushing boundaries. Take a bit of a risk. Have a go. And keep going. Among its own initiatives, Auckland Council is in the early stages of rolling out a series of localised coastal plans. The plans will look at managing possible sea level rise in specific neighbourhoods identifying options for hard or soft defences or managed retreat. Council will focus on relatively small chunks of area that are already struggling with erosion and have the greatest perceived need. There is no one-size plan to fit all places. Auckland Council is also looking at publishing easily-accessible storm inundation maps. Ian says it’s already possible to get hold of this type of information but council is trying to help make data more readily accessible to people who may not be out looking for it on a regular basis. “We haven’t cracked this yet,” he says. “So if have any great ideas on ways of working with different communities on these sorts of technical issues, please let us know. We’d be really pleased to hear about them. Ian also notes that while most people who work in councils’ parks departments believe in the science of climate change, they have to work alongside colleagues who may not share their views. He adds that in many cities council parks often have to play a defensive role between the built environment and the sea. Many people’s first reaction is to demand a sea wall is built. “It takes a lot of time and effort to get them to understand the benefits of soft defences. We’ve got some examples around the Manukau Harbour and Orewa where we’ve managed to get to that point. But in other places we’ve haven’t managed to convince people of the benefits of soft defences. He advises council officers to look into the updated health and safety legislation around any potential danger from trees in parks and public places and who may be liable in case of an accident. And he raises the question of liability and compensation if cliff-top houses were to be threatened by rising sea levels. “Auckland is a coastal city. If you look at cliff-top houses with sea views between Milford and Takapuna it’s probably hard to find a house worth less than $8 million. So what happens if the cliffs start eroding – or if the houses start falling into the sea? “In general we think that’s just a natural occurrence so the council’s not liable. I think that’s probably true. But I guarantee that will be tested in court and if we’re proved wrong – if we happen to have an esplanade reserve or some sort of reserve between the property and the sea – and the danger, or threat, is coming through your [council-owned] reserve and on to the private property causing damage there’s going to be debate taking place. Ian advises other councils to think about such issues now. 1 LANDFILL One month this year we had the biggest dumping to landfill that we’ve ever had in the history of Auckland. We’re not winning the battle. There’s a huge difference between an objective around zero waste and the practicality. Auckland Council is making an impact but that’s being overshadowed by the growth in our city. The amount of construction material going into our landfills is enormous at the moment. 2 INTENSIFICATION The debate about intensification is probably the biggest thing that we can do as a city in terms of mitigating climate change. At the moment Auckland houses about 35 percent of our country’s population. We are heading to housing over 40 percent. 3 FUNDING We still have an issue about ad hoc funding. We can respond to a particular issue in Orewa or at Maraetai, for example. But I can’t say we’ve got a planned approach. We don’t have a plan and money for the next 15 years, for example. That’s where we’re heading but we’re not there yet. 4 MANAGED RETREAT We’ve still got debate about managed retreat. At Brown’s Bay, for example, the land is quite low-lying. So if the sea were to rise by 1.5 metres it would go inland by about a kilometre right through the town centre. How would you manage that? Managed retreat in a heavily urbanised environment may not be a realistic option but the alternative may be to put a solid wall in front of a beach that people love. Source: Auckland Council’s director of community services Ian Maxwell, speaking at the New Zealand Recreation Association Coastal Parks and Climate Change seminar.